Or: I Can Read A Lot More German Now! Ausfahrt is and if they have good shopping. He laughed. A LOT. 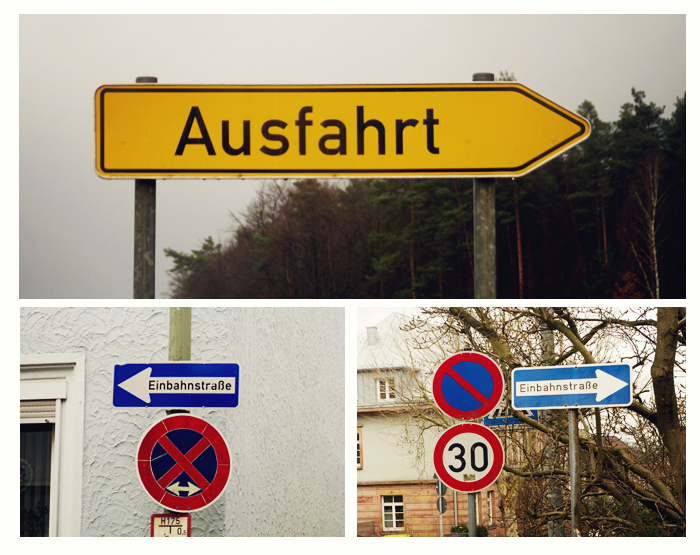 An ausfahrt is an exit from a main road." "Parking on Einbahnstrasse. My first day here I was struggling to stay awake until at least 8 pm so I could better adjust to the new time. Mike, ever obliging, took me to Kaiserslautern to look at the shopping district. If you've never been to Europe, you should know that you usually have to park a goodly way off and walk. No problem, except that I didn't really know where we were and Mike gets lost in a shopping mall in The States (yes, they get capitals now). Knowing this, I take a good look around as we get out, noting sites and road signs in case we get lost. Smart, yes? though I couldn't figure out why. 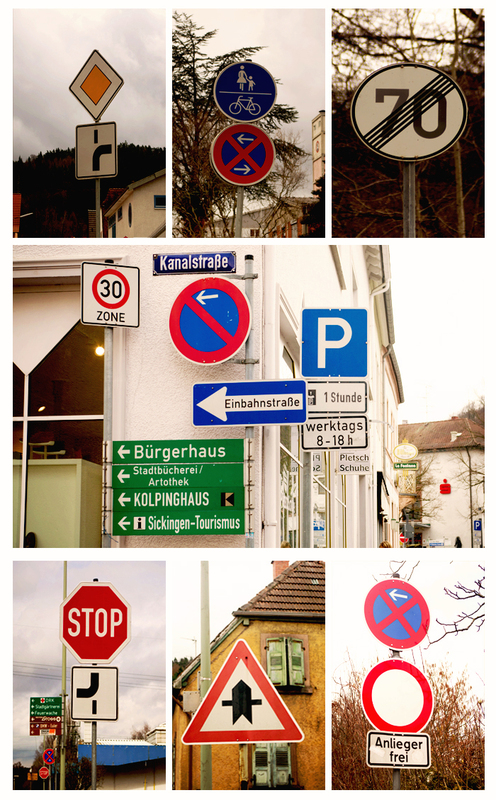 Einbahnstrasse means "one way street." There are einbahnstrasses everywhere." I still giggle to myself every time I see or say "Ausfahrt." Yes, I'm a big child. Ok, so here's the story behind that day: I arrived on the 0600 (that's 6 a.m. for you non-military time tellers) flight after having been separated from my husband / best friend / love of my life for nearly 8 months. It was my first time flying internationally. It was easily the biggest, scariest move of my life. To say that I didn't sleep for several days beforehand would be an understatement. I was nervous and excited and sad and scared and hopeful and overwhelmed. I knew I would miss my family, but I also knew my place is - forevermore - by Mike's side. And did I mention the weight limits placed on me? I feel personally attacked by the airlines every time I fly. Why do they hate me and my shoes? What have we done to deserve this sort of discrimination? Packing was a logistical nightmare. Mike moved about 4 months before I finished nursing school and about 7 months before I graduated. So I had school clothes, winter clothes, spring clothes, shoes, and books - SO.MANY.BOOKS. Oh, and the dog. Lola's a bit of a princess; the ladies of this house do not know the meaning of "low maintenance." So there I am making my way through the airport with 3 HUGE suitcases packed full of pretty much every piece of clothing I own shoved and shrunk into Space Bags to try to make it all fit (failed- Mom still had to mail a huge box of underwear to me), carrying Lola in an over-the-shoulder dog carrier since she was my carry-on (nobody puts Baby in cargo! ), and chugging coffee like there's no tomorrow. No surprise that I didn't sleep much on the plane, huh? The following morning Mike is driving home from the airport and pointing things out as we go (because I am obviously cataloging everything he tells me about how to find my way around) and I keep seeing these yellow arrow signs that say "Ausfahrt" at every exit from the Autobahn. It didn't occur to me that I had been seeing the same signs for over an hour. So I asked. And he laughed. Fast forward to today: I now know that most people who first arrive in Germany think Ausfahrt must be a city. They even have t-shirts and glasses and the like that say "I finally found Ausfahrt!" or "Went to Germany, but never found Ausfahrt!" so I'm not the only one. Also, the government here deemed me minimally safe to drive so I can read traffic signs at least passably. It used to give me a headache trying to read each one and make it all make sense in time to respond, but now it's just second nature. I ignore most of the signs, actually. Funny how we adjust to things. Signs, signs everywhere there's signs... Love me some Tesla! As for the Einbahnstrasse mishap... well, perhaps I shouldn't have been so smug. I still don't venture down to that shopping area without my GPS because I WILL get lost. And I can only park in one parking lot - partly because it's the only one I can reliably find and partly because it's the only one I sort of know my way home from. Unfortunately for me (and fortunately for Mike), that lot is currently under construction, so no shopping for me at the moment. I also know now that parking tickets in that parking lot will cost me 5 euro and that I will get one each time I'm 10 minutes late coming back to my car. Parking is a whole other issue around here.